Last summer I made a kit for the Redbird Bag. In the instructions, I suggested alternative uses for the design and just this weekend actually tried that with this stocking version. The Redbird Stocking uses most of the same bits and makes a fine little project for an afternoon of stitching. Now I can imagine it made up in so many different ways depending on little details. If you purchased the kit earlier, email me and I'll send you the new PDF for the stocking - free. It's also available as just the PDF in my Etsy shop. I have lots of lovely, pre-washed linen here waiting to be something pretty. Hmm, what else? Perhaps my favorite part of the holiday is just after. All the splendid rush of arriving, collecting, cooking, eating and clearing up finally subsides to that softer, relaxed after. We had a wonderful few days with everyone here, in one place or another, all together. That's what I care about most. The food was fantastic, too. I had a very young visitor the other day who collected a fistful of leaves from our beautiful tree, the last of the last color here. She was so in love with them, carrying them around like a little bouquet. A few more inspired some playful doodles. 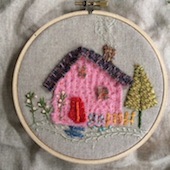 ** My sweet friend, Kim at Daisy Cottage is hosting a giveaway for my Hastings Cottage kits and a custom cottage made just for one lucky winner! Stop by and leave a comment there to enter. I couldn't stop making these stitchable ornament designs. Wish you could have heard my childish, out-loud whoop when I realized that the mouse could have a loose thready tail! The crisp red and white Scandinavian look of these 6 little ornaments pleases me to no end. I loved making them, designing and stitching. And I loved it that everyone at Silver Bella bought them up in a blink. There are more for you. I stitched the samples up on the way to Omaha and finished all 6 designs from NY to Chicago to Omaha, on the plane and at the gates. So, there is plenty of time to make them for the holiday tree or as gift tags or a garland. Wouldn't the panel make a really cute pillow front too with the feather stitch border worked as well? I'm posting them in my Etsy shop now, both as a panel by itself and as a kit with white felt and floss. I have so many things to tell you this week. Still not fully unpacked, but had to take a day yesterday for my mom. We went into the city for a doctor's appointment at the medical center. When the valet attendant there helped me get her out of the car, she was so cute and told mom she looked like she was headed for a Broadway show. Got my wheels turning. I just pulled in and that gentleman right there on the left made it all work seamlessly. Yes, madame, this way please. Out of the car and into a secret lift by the legendary steps, into the gleaming lobby with the fanciest of the fancies. Lunch at the Oak Room, one of her favorite spots. Quote of the day: after I pointed out to Mom that they had steamed brussel sprouts on the menu, she looked at me over those reading specs and said, "I didn't come to the Plaza to eat brussel sprouts!" We poked around the hotel and took full advantage of every spec of elegance. More than the average wonderful. It was "simply fantastic!" Four days in Omaha plus one to get home flew by in a blink! We all had such a great time this year and I'm trying to find a place to jump in and share it with you. It feels like a double dutch jump-rope. Classes, friends, teachers, students, dinners, shopping, vending, sharing. Whoosh! The amazing students! Eager, talented, generous, dear. They challenged and inspired me, made me laugh, think, listen. But mostly, they made me feel so happy and loved. This was my fourth year as a teacher at this event and what was the same was like Home. What was new was refreshing and memorable for the excitement it stirred. Special thanks to Fiskars, Marcus Brothers and Anna Griffin for sponsoring my classes and to Cari for setting me up with materials there. The teachers were gifted, accomplished, down-to-earth, delightful. The students shared handmade gifts and kind words to get me through the quiet studio days. Matthew sent his freshly printed magazine for me to share with the Bellas. I connected with old friends and met so many new artists and designers. By week's end, I felt as if I'd known my fabulous roomie all my life. Still, it goes by too fast. Each year I always wish I could stay an extra day and take classes from the other teachers. So much to learn! All things bright and beautiful and Bella-fied. It was a set of days richly embroidered with art and friendship. Kind of like the papered basket we made in class, each panel carefully and lovingly decorated, stitched together to make a sentimental circle. Thank you so much, Teresa and all the splendid Bellas, for this year of wonders. How lucky are we?! Off to Silver Bella! I'll be back here Monday. Wishing you a wondrous weekend inside and out. The first batch of stitchable ornament kits are on their way and I thought that some might like a little more info on finishing them. There is a short version on the panel itself, but now that I've done it a few times, I have some helpful notes and an easy method to suggest. When you have stitched the whole panel, press it face down and get the work wrinkles out. Tape it to a window and place a sheet of paper (I used standard white cardstock) over the panel. Trace the outer design shapes. Cut them out on the inside of the shape lines and cut the ornaments out also but with a 1/4" allowance. Snip vents all around any rounded edges, corners or angles. This makes it easier to fold under. Place a few smudges of white glue on the paper template and attach it to the back of the ornament. Notice the word smudge- this means use as little glue as possible. You're aiming for tacky as it only needs to stay in place and too much glue will soak into the fabric and show on the front when it dries. Add a few more glue smudges to the outer edges of the back of the paper template. With the right side of the ornament facing you (see above), fold the raw edges over onto the tacky back of the paper. Keep the finished front edge in mind as you roll and fold. Doesn't matter so much how the back looks so watch the front and try to neaten the stitched edge as you fold, staying true to the ornament design. Works really well and is super easy to do. Lightly glue or sew the ornament (but seriously, you might as well glue because it's easier and looks perfectly fine) to the felt. Trim felt with pinkers so a scant 1/4" edge of felt shows all around. Use red thread or a ribbon to make a hanging loop. Hope that helps! I love mine- probably more than I should, but I think they are just about the cutest things ever! I made a second version of the ornaments in another colorway. This time I stitched them up with white thread. I kind of like them with a few details left unworked so the printed design shows itself a bit too. My favorite one to stitch is the tree with the feather stitch, an old standby for me. And darling holiday cards too. My next post will be about the actual finishing and tips to share. I have to get ready for Silver Bella ... wow, it's this week! This darling image is from Matthew Mead's Holiday magazine which is shipping this week. Knowing it is cover to cover amazing, I'm so excited to see it! Stop by Matthew's blog today and leave a comment to win one of my Hastings Cottage Kits, based on the design I created exclusively for his magazine. The winner will also receive a handmade felt cottage ornament made up just for you in any color available from my felt stash. I'll try to make it look like your house or perhaps a friend's. Sweet gift idea! So please visit Matthew today and leave a comment to win a cottage and kit. Still time to order a magazine too. Happy holidays are on their way!